Family Practitioner David Laposky , M.D., of Pine River who has more than 30 years’ experience practicing medicine in rural Minnesota, began treating patients at the Longville Clinic in December 2017. 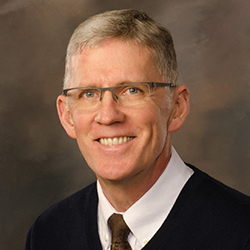 Dr. Laposky earned a Medical Degree in Family Medicine at The Sioux Falls Family Medicine Residency in South Dakota and a Medical Degree at the University of South Dakota in Vermillion. He also holds a Bachelor of Science degree in Zoology from South Dakota State University in Brookings and special Drug Enforcement Agency certification to treat opiate dependent patients with medically assisted treatment. A member of the American Board of Family Medicine, he has special interests in nutritional counseling and treating metabolic syndrome with dietary approach and addiction medicine. Outside of his practice, he enjoys hunting, fishing, piano and guitar and is active at Riverview Church serving as a worship leader, elder and Sunday School teacher. Dr. Laposky and his wife, Beverly, have four children and 10 grandchildren.